Rachel Dolezal, 39, the former head of The National Association for the Advancement of Colored People (NAACP) Washington's chapter, who claimed to be black for years before her parents revealed she is actually white, has officially changed her name to 'Nkechi Amare Diallo' in a Washington court. According to Daily Mail, they obtained documents showing that she changed her since October, 2016. Her new name, Nkechi is short for Nkechinyere, which originates from the Igbo language of Nigeria and means 'what god has given' or 'gift of god.' While, Diallo, meaning 'bold,' is a last name of Fula origin. The Fula people are a Muslim ethnic group thought to have roots in the Middle East and North Africa, who are now widely dispersed across West Africa. Dolezal has reportedly been finding life difficult and has being unable to provide for her three kids or even pay her rent since her parents outed her two years ago. She has applied for at least, a 100 jobs, including a position at the university where she used to teach but unable to secure any. According to her no employer is willinging to hire her. 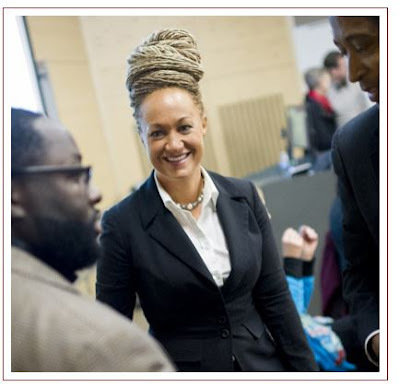 A friend reportedly helped her pay two months of rent and Dolezal said she expects to be homeless. She changed her name in the hopes that it would help salvage her reputation.